Bratislava, the capital of Slovakia, is located along the Danube River, in a beautiful location between the mountains of the Alps and the Carpathians, a few kilometers from the Austrian capital Vienna. The city of Bratislava has an interesting old town dominated by a beautiful castle, the old town is made up of a maze of streets and squares where alternating fine buildings of all styles from Gothic, Renaissance, Baroque, etc.. The Main Square (Hlavné námestie), the old market square (Marktplatz), where takes place the Bratislava Christmas Market, is the heart of the city. Very nice is also the nearby Hviezdoslavovo Square, and do not miss a visit to the only remaining gate of ancient walls, the St. Michael’s Gate (Michalská brána) with an elaborate eighteenth-century copper roof. 1) Bratislava Christmas Market (Vianočné trhy Bratislava). 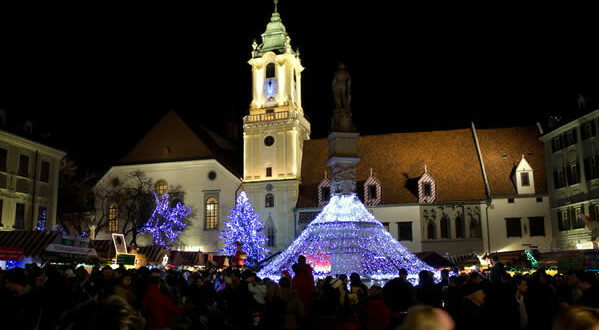 The Christmas market in Bratislava takes place on the main square of the city (Hlavné námestie) and the square of the Franciscans (Františkánske námestie). The Christmas market is comprised of more than 100 stalls presenting items for gifts made with wood, glass, leather, wicker, beeswax, Slovak handicrafts, Christmas trees and many Slovak delicacies such as sausages and meat roast, cabbage soup, bread with lard and onion, potato pancakes, gingerbread, biscuits, wafers, honey and hydromel. Local artisans like the blacksmith, the ceramist and the glazier present and sometimes carry their products directly next to the Old Town Hall (Starej Radnice). Very rich is the cultural program that is organized every year along with the Christmas market with concerts, dance performances, songs and folk dances, performances for children. These events are always organized in the main square. During Christmas Bratislava is beautiful thanks to the lighting that decorates the entire old city. Opening Hours: every day from 10am to 10pm.